Partly cloudy. High 58F. Winds SW at 5 to 10 mph..
Cloudy skies. Slight chance of a rain shower. Low 48F. Winds SE at 5 to 10 mph. Louis R. Giancola sat for The Sun's Easy Chair feature. Louis R. Giancola, the president and CEO with the second longest tenure in hospital history, retired on March 29 after more than 18 years at the helm. Among his accomplishments were construction of the Frost Family Pavilion and the Orthopedics Center. Here he is shown at the Orthopedics Center dedication in 2007. Three presidents of South County Hospital, pictured together at the 2004 rededication of the granite sign. Ralph Misto, Donald Ford and Lou Giancola. Ralph Misto got his start at South County Hospital in 1966 as director of the laboratory. He also served as director of personnel and chief operating officer before he was named president in 1989, a post he held for seven years. When Donald L. Ford retired as president of South County Hospital in 1986, the board hired Donald J. Mazzarelli from Waterville Osteopathic Hospital in Maine. Mazzarelli “had a honeymoon for about a year and then things started to happen,” said former board member Rudi Hempe. The new administrator had a tough act to follow, although Ford took pains to stay out of Mazzarelli’s way, once even yelling at a reporter who called him for a comment after his retirement. Mazzarelli was beset by a number of issues, many of which were beyond his control. Among those were lower Medicaid rates and higher malpractice insurance rates for obstetricians. The hospital, under the new president’s direction, responded by opening a women’s clinic at Salt Pond Shopping Center in Narragansett and subsidizing new doctors’ malpractice premiums. During Mazzarelli’s tenure, the hospital built a $4 million surgical pavilion, added twelve doctors to the staff and opened an ExpressCare facility in the Emergency Department. Still, it was not enough and the board decided to make a change in leadership, which they did in August 1989. With the departure of Mazzarelli, the Board of Trustees wanted a leader who could restore the confidence of both the hospital staff and the community. They chose longtime hospital administrator Ralph L. Misto Jr. Hired by Ford to run the laboratory in 1966, Misto had risen through the ranks, becoming the hospital’s first personnel director in 1975 and eventually vice president for management services and chief operating officer. He had actually just taken early retirement when the board called on him to serve as acting president. He was 55 years old. With his human resource background and understanding of the hospital’s values, Misto “bandaged some wounds,” said LeeAnn Quinn, the hospital’s director of infection prevention and control. In an interview with Providence Business News in 1992, Misto described a hospital flexible enough to react quickly to change, but small enough to maintain its bottom line. During his tenure, a new maternity ward was opened with all-in-one labor/delivery/recovery rooms, a new pediatrics unit was built and the R.I. Renal Institute opened a new dialysis facility on hospital property. The old problems of finances and patient census had not gone away, but his leadership gave staff and community some reassurance that the small hospital would continue to grow and thrive. The hospital was running slim profit margins — $28,000 a year on a $45 million budget — and coping with what Misto called the “very high peaks and lows” of admissions. But the Joint Commission on Accreditation of Healthcare Organizations gave the hospital a 94 percent score in 1993, ranking it with the top five percent of hospitals nationally. The hospital’s challenges were far from over, but it could not be accused of stagnating any longer. Misto retired in 1996, and the Board of Trustees hired Patrick Muldoon of North Adams, Mass., to replace him. Once again, the hospital was in expansion mode, with plans to build a medical office building to provide office space for doctors. South County Hospital also signed a memorandum of understanding with Westerly Hospital and VNS Home Care to combine their visiting nurse services into one organization. Muldoon, according to retired nurse Maureen Daly Blazejewski, was “socially smooth,” a “people person” whom many genuinely liked. 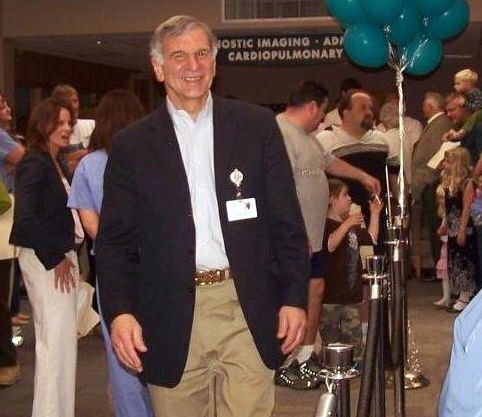 Muldoon departed the hospital in September 2000, four years after his arrival, and went on to a successful career in Massachusetts hospitals, retiring in 2017 as CEO of UMass Memorial Medical Center in Worcester. Stepping into the breach would be Louis R. Giancola. His career had included positions as chief operating officer for Lahey Health and Women & Infants Hospital. Giancola would face as many challenges, if not more than, his predecessors. None of this would be easy. Besides rebuilding staff morale and filling key positions, Giancola still had those perennial problems to deal with: revenues and patient census. By 2003, South County Hospital ranked as the second least profitable hospital in the state. Giancola cut the full-time equivalent positions from 630 to 600. Still, the hospital’s profit margin continued to swing wildly. In fiscal year 2005, it posted a $1.9 million profit. A year later, the hospital was $2.5 million in the red. The losses mounted: in FY 2006, it was $2.5 million again. A year later, the operating loss was a stunning $6.3 million. Although the deficit was on a larger scale than in the past, the culprits were familiar: bad debt (hospital bills that patients don’t pay), an increase in the health insurance rates for employees, costs for recruiting specialists, interest on debt, and rising liability insurance premiums. While the problems were daunting, the guidance of new Chief Financial Officer Thomas Breen and others proved critical as the hospital negotiated lower interest rates to better position itself in both the short and long term. This enabled Giancola to initiate a growth strategy. In 2007, South County Hospital opened the Frost Family Pavilion, a 60-bed, state-of-the-art, three-story addition that replaced outdated beds in other areas of the hospital. All of its rooms are private and commodious, with pullout couches, flat-screen TVs and full private baths. Like a university spiffing up dorms to attract freshmen, Giancola was banking on private rooms as the future of health care. Earlier that year, the hospital dedicated its new Orthopedics Center. The same baby boomers who had swelled the hospital’s maternity ward in the 1940s and ‘50s were now ready for knee and hip replacements. Investment in cutting-edge technology like robotic-assisted Makoplasty, which allows patients to go home the day after surgery, would deliver South County Hospital one-third of the state’s orthopedic clientele. This investment in robotic technology for surgery continued most recently with the addition of the ExcelciusGPS system for spine surgery — another first in the state — and the da Vinci Xi Surgical System for urologic and general surgery. The growth strategy was a successful one as the hospital has recorded a profit for the past 10 years. Giancola is also the type of CEO who tries hard to get to know the institution’s 1,400 employees, writing articles about them for the monthly newsletter and signing birthday cards for them each month. Ask just about anyone on the hospital staff or in the community about Giancola, and you will hear admiration for his work, and regret that he is leaving. “Lou is a very caring individual that I can’t say enough good things about,” said Stephen A. Alfred, South Kingstown’s former town manager, in particular citing Giancola’s work to bring together the schools, the hospital, and local agencies to solve community health needs. On April 1, Giancola handed the reins to Aaron Robinson, former CEO of Community Hospitals in Florida, who was selected by the Board of Trustees after a nationwide search.